Plagued by infighting and the constant threat of a far-right insurgency, congressional Republicans have little to show after nearly 11 months at the helm of a unified government. The world-class fuckup that was Tuesday night’s Alabama special election, as extraordinary as it was, only adds further credence to the notion that a “blue wave” is coming to cream the GOP’s incumbency next fall. Despite its tenuous grasp on the legislature, and the looming threat of a revolted constituency come November, the party of Trump remains poised to arm Democrats with yet another advantage tomorrow, as they sit idly by watching FCC Chairman Ajit Pai dismantles net neutrality—regulations that, according to a credible survey this month, are actually favored by an overwhelming majority of Republican voters. As an opposition party, the GOP relied heavily on the perceived failures of its counterpart to seize control of the government: swarms of illegal immigrants crossing the border, the rise of ISIS, and the washing away of “traditional” American values. But it’s difficult to imagine those themes will sound as sweet after two years of Republican control. Uneasy lies the head that wears the crown, or so it goes. In a state that hasn’t sent a Democrat to the US Senate since 1994, a pro-choice Democrat who supports Obamacare, minimum wage hikes, and expanding Medicaid coverage—which is on the GOP’s chopping block next year—just won an election despite a flood of RNC cash and the backing of the White House. (Yes, he was a credibly accused child molester.) So it’s a wonder why the widespread concerns over the FCC vote, which would appear to offer little or no political capital, haven’t lit a fire under Republican lawmakers’ asses. The cost may, in fact, be dramatic. A non-partisan study published out of the University of Maryland’s School of Public Policy yesterday revealed that only one in five Republican voters actually support Pai’s proposal. And the results weren’t just gathered with random phone calls; the respondents were briefed beforehand on both sides of the argument. According to the program’s director, that briefing had been reviewed by a government official representing the Trump administration’s position. Nevertheless, through their own inaction, congressional Republicans—who alone, through sheer force of numbers, have the power to delay tomorrow’s vote—stand ready to cement Team Democrat as the official pro-internet party, yoking themselves in the meantime with Pai’s spurious claim that deregulating the broadband industry will, somehow, benefit American consumers more than Verizon’s profit margins. The FCC argues that “market forces” will prevent the Comcasts and AT&Ts of the world from doing anything to violate net neutrality—even though they vigorously lobby against the rules enforcing it. But competition in the ISP market is a joke. Based on the FCC’s own data, roughly 129 million Americans only have one ISP provider to choose from. And Pai’s argument that the net neutrality rules have hampered innovation have been disputed by the ISPs themselves. The studies oft-cited by Pai are—spoiler alert—funded by the very industry that stands to benefit most from his proposal. 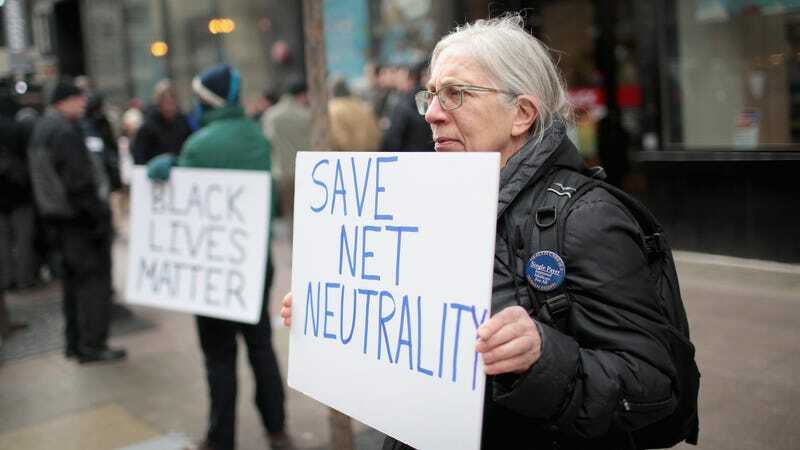 The GOP is underestimating the potency of this issue and the political cost of being “anti-internet” next year may very well scathe Republican candidates in close elections. The Republican commissioners on the FCC aren’t elected officials, so they won’t be the ones stuck defending a bunch of cable companies in town hall meetings and debates next fall. Pai desperately wants this victory. If Republicans in the House and Senate start feeling the heat today, he should strongly consider taking the day off, unplugging his phone, and finding somewhere to hide. Correction: A previous version of this article identified Rep. Mike Coffman as a Republican of Arizona. He represents Colorado’s 6th congressional district. We regret the error.